One of the most important things you can do as a homeowner to safeguard your heating and cooling system is to have it regularly maintained. A routinely and well maintained system will not only perform at peak efficiency, it will be much less likely to break down. Avoiding the inconvenience and expense of an unexpected service call is only one aspect of the money-saving advantages of regular maintenance. Since the cost of heating and cooling your home make up more than half of the typical utility bill, it is wise and cost effective to safeguard that system as much as possible. Accumulations of dust and dirt decrease the efficiency and reliability of your system. And when it is not functioning effectively, the unit has to work harder, often resulting in erratic air temperatures. Not only can regular maintenance save you a good deal of money on utility bills, but you are also often rewarded by the extended life of your system. A well maintained heating and cooling system may last three to five years longer than one which is neglected. Also, many manufacturers require that routine maintenance is performed in order to meet the specifications of their warranties. It just makes sense to maintain equipment that represents a major expense, both in initial purchase and in continued use. At D.G. Meyer Inc. we take pride in our service department. Our service department is here to serve your needs 24 hours a day, seven days a week. Whether your AC is out and you need service today, or you are in need of preventative maintenance or duct cleaning, our trained technicians are prepared to assist. All of our technicians are N.A.T.E. and E.P.A. certified. Most of our techs have graduated from the Daytona State Advanced Technology College HVAC program. Each year D.G. Meyer Inc. sends our technicians to classes for continuing education so that they can keep up with the ever changing HVAC world. We are an equal opportunity employer. Every employee is drug tested and background checked. Ensuring our customers’ safety and earning their trust is a top priority at DGM. We know how busy our customers lives are, and our goal is to provide you with service that respects both your time and your budget. Call us today to speak with one of our friendly staff for more information. 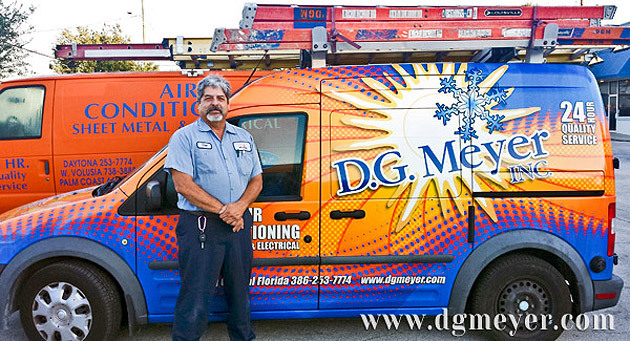 We are also well aware that there are many companies that offer air-conditioning service and repair in Central Florida, so we value our customers and strive to constantly maintain and improve upon the high quality of service that you have come to expect from D. G. Meyer. Thank you for the opportunity to earn your continued business. Repair of all makes and models of heating and cooling equipment for both residential and commercial. Maintenance programs available for residential units. Maintenance programs available for commercial customers. Repair and maintenance of water to air units. Filters sales. We stock all filters! Repair and replacement of bathroom exhaust fans, residential and commercial. Maintenance of water cooling towers and water pumps. Maintenance of exhaust hoods for restaurants and commercial buildings. Maintenance of make up air for all buildings. Inspection of fire dampers to keep up to code for hospitals, nursing homes and medical offices.